I started my yoga practice purely for physical fitness. I wanted to see what it could do for the health and appearance of my body. I gave little attention to anything except the physical part of yoga, and for years I simply ignored any of the meditative exercises. What a huge mistake. I look back at all the time I lost by ignoring this very important part of yoga. If I could do it all over again, I would fully embrace all the meditative experiences yoga has to offer. As I practiced yoga over the years, something changed. Even though I was still ignoring the meditation and relaxation techniques, holding the yoga postures steady and fully concentrating on each and every part of my body became meditative. Gaining awareness of what my body felt like and what muscles were being engaged or relaxed took full concentration. As my practice became more advanced, concentration became more intense and I began to enter a meditative state while holding the postures. To hold a difficult posture steady, the mind cannot wander. It must be fully focused on every aspect of the body. Once alignment and steadiness are achieved, awareness then moves to the breath. Deep concentration on the breath while in an advanced yoga posture is most definitely a form of meditation. It took me many years of practice to realize that yoga was so much more than just physical fitness. Although the physical benefits of yoga are truly amazing, we cheat ourselves when we practice yoga only for that part of it. As the mind becomes focused, yoga becomes a form of meditation. When you complete a yoga session, you have this wonderful feeling of being both relaxed and energized. Stretching and strengthening our muscles releases blocked energy and leaves the body feeling strong and vibrant. The meditative part of yoga such as holding the pose without movement, complete body awareness, intense concentration and pranayama breathing, deeply relaxes the mind. What a perfect combination! Before a yoga practice session, sit in a comfortable cross leg position with eyes closed. Place the fingers of the right hand over the heart and the fingers of the left hand across the forehead. This symbolizes and activates the connection between body and mind. Allow the body to communicate to the mind and allow the mind to open and receive the body’s messages. Maintain this connection throughout your practice. During a difficult yoga posture, bring the mind to focus on all sensations the body is experiencing. What is the body telling you? What are you feeling? Be aware of outside thoughts pulling you away from the body and gently bring your focus back. Yoga is about this mind and body connection. Our minds are constantly going from one thought to the next. It is almost always in a state of constant chatter. Thoughts of what we need to do, what we have or haven’t accomplished, what will happen next in our lives, etc. etc. etc. The list goes on and on. I often think of a verse in a David Bowie song that states “my brain hurt like a warehouse it had no room to spare, I had to cram so many things in there, everything in there”. That is generally the state of our minds. We are focused on almost anything except the messages our physical bodies are giving us. And our body continuously tries to send us messages that our minds are too busy to listen to. It is only when we experience pain or illness that we are then forced to pay close attention. Have you ever noticed, at the height of particularly stressful and exceptionally busy times, you're more likely to come down with a cold, flu or injury? Your body is forcing you to stop, slow down, and pay attention. At that point, you have no choice but to listen. It has literally forced you into awareness. The practice of Yoga cultivates this mind body awareness. I believe it is one of its greatest gifts to those who practice yoga. There is nothing more important than listening to what the body is telling you, not only during your practice but in every day life as well. At any time, on or off the mat, when you catch yourself mentally or physically running in overtime, take just a minute or two, place a hand on the heart and forehead, close your eyes....feel....listen. What is meditation and why is it so difficult? To keep our body still and our mind focused sounds simple enough; but for those who have tried meditation, we know it is not. Keeping our bodies still can be difficult enough; keeping our mind still can be near impossible. So where do we start? We start with the body. We start here because if the body is not comfortable, that is where the mind will focus. Soon after your thoughts will turn to “how long have I been doing this” and “when will it be over”. So we need a body position that allows us to breathe freely and does not pull the mind’s attention to it. Lying down might seem ideal, and if you have aches and pains this may be your only option. If the back is curved while lying down, this can cause discomfort and/or restricted breathing. If comfortable in this position, you may simply fall asleep. Sleep is not meditation. In meditation the mind remains fully alert to your surroundings. The ideal meditative posture is seated on the floor with ankles crossed. If you are not flexible, sitting on a straight backed chair will also work. Sit on the front edge of the chair with the knees hip distance apart and both feet flat on the floor directly under the knees. The chair should be at a height that allows the thighs to be parallel to the floor. Sit up straight with the torso balanced directly over the hips and the head directly over the torso. The back does not rest on the chair but is forward away from it. The abdomen is slightly extended to accommodate the breath. The hands rest on the knees or are folded in the lap with the back of the right hand resting in the open palm of the left. Scan the body for flexed muscles being especially aware of the neck and back muscles. The body should feel balanced and relaxed. Maintaining the position should be effortless. Meditation can be thought of as deep concentration. The breath is a common point of focus, but you can choose a word or phrase, an object or even visualization. Whatever you choose, the mind will most likely wonder. Just as we train our muscles to stretch and be strong in yoga, our minds need to be trained as well. During a meditation session, you may find yourself so engrossed in a thought that you completely forget you were trying to meditate. When you become aware of this, simply bring the mind back to your focus point. You may find you have to do this repeatedly. It can be very frustrating and you may feel your attempts at meditation are futile. But understand your mind is being trained, and each time you bring it back you are gaining control. It is the beginning step to meditation. With time and practice, the mind will begin to stay focused. Although thoughts can be a constant obstacle when meditating, another technique is to simply observe your thoughts. Observing means to not dwell, analyze, or become emotionally involved. It means to merely acknowledge that the thought occurred and then let it go. As you begin using this method, you may find yourself pulled deeply and emotionally into a thought. When this happens, bring yourself back to the role of observer. Do not label the thoughts or engage in them in any way. Merely witness and let go. How long should one meditate? Short periods of time, about five to ten minutes every day, are a good starting point. If possible, be consistent with time and place. Longer periods, at least in the beginning, can be frustrating because most of the session will be spent bringing the mind back to focus. It can feel exhausting. When you begin to experience true meditation, the body and mind are renewed and energized. Over time, you will start to experience brief moments of pure concentration. When you realize this is happening, it is so exciting that it will probably break your concentration. Do not be discouraged. That wonderful glimpse of pure peace you momentarily felt is a sign that your efforts are working. You are on your way to enjoying the physical and mental rewards of meditation. A point I can’t stress enough is that our minds are very quick to return to their old pattern of uncontrolled mind chatter. If you stop meditating on a regular basis, all gains accomplished will be lost. When you try to meditate again, you will be starting right at the beginning, as if you had never done it before. Be patient with yourself while learning. You are in the process of training the mind. A mind that has been allowed to run ramped with thought as it pleased. Control of the mind is well worth the effort. With frequent practice, it will respond and you will be rewarded with an inner peace far beyond that which you’ve ever experienced. There is a Yogic proverb that states “Life is in the breath; therefore he who only half breathes, half lives”. This proverb tells us that the way we breathe directly affects our physical and mental well-being. To a great extent, it affects the quality and length of our lives. We can go for weeks without food and days without water, but life expires in minutes without air. A primary source of our sustenance comes from an element in the air we breathe. In Yoga, it is known as prana or life-force energy. Prana is not the air itself but the subtle life-giving energy extracted from the air. The more we have of this energy, the more “alive” we are. Although this energy is present in all forms of nourishment, it is most accessible in the air we breathe. Most people have shallow breathing habits and use only the upper part of the lungs. Even when attempting a deep breath, the lungs are only partially filled. Yoga breathing techniques (pranayama), enable the yogi to utilize the fullest capacity of breath. The breath is intrinsically linked with our state of being. When we breathe in a shallow and rapid fashion, it contributes to a nervous mind and body. Slow, rhythmic and deep abdominal breathing lessens anxieties and tensions. The mind relaxes and concentration is increased. Practicing Dirgha breathing, also known as the Three Part Breath or Complete Breath, utilizes our capacity to pull in life-force energy. At the beginning of the inhalation, the belly is extended to pull prana into this area, the inhalation then expands the rib cage and is completed with the upper chest and lungs expanded. Prana is pulled deeply into these three areas. As the breath is released, the exhalation contracts and relaxes the body in the opposite order in preparation for the next deep inhale of life-force energy. The practice of yoga gives us the ability to become aware of our breath. The practice of yoga pranayama brings us an abundance of life-force energy. The performance of Hatha Yoga asanas, and the relaxation of muscles done between asanas allows this energy to flow freely throughout the body. It is this life-force energy that brings those who practice yoga vitality and good health. One cannot deny that stretching feels really good. We stretch our bodies spontaneously when we get up in the morning or whenever we have not moved for long periods of time. Being stiff and inflexible is an unnatural condition for the body. It causes our energy levels to plummet, and our minds to become stressed. As we accommodate our physical restrictions by changing the way we do things, lack of flexibility becomes a vicious downward spiral as one muscle after another becomes rigid and painful to use. But yoga helps us restore flexibility. Stretches awaken and warm the muscles, tightness loosens, and our minds become alert. This invigorating feeling is what the yoga experience is all about. The three main causes of tightness in muscles are genetics, lack of use, and mental stress. To bring about change through yoga, the student must work on each of these areas. Structural inflexibility caused by genetics can require more work to improve, but muscles can still be brought to a higher level of movement through yoga. Stretch receptors give us internal feedback and stop us from stretching too far or too fast. But yoga postures are performed slowly with periods of relaxed holds. The muscle receptors are slowly introduced to a new level of flexibility which gradually expands their capacity for movement. Another cause of muscle tightness, and without a doubt the most common, occurs simply from lack of movement. A sedentary life style can have us sitting for long periods of time with limited movement throughout the day. This type of muscle tightness is easier to change than genetic limitations. A balanced sequence of yoga postures can fairly quickly restore this most common type of inflexibility. Finally, our mental state affects us as well. Emotional stress can unconsciously cause muscles to tense and tighten. The mind body connection practiced in yoga brings awareness. The yogi begins to clearly see how the mind and body are always connected and how one strongly affects the other. Yoga pranayama breathing and meditation techniques relieve stress at a different level than the postures. Deep breathing, mindful focus, and the release of ego, all help the mind to relax. And as our mind relaxes, what occurs is an unconscious release of nervous tension in the muscles. Energy is allowed to flow, flexibility, health and peace of mind are restored. There is one other area that should be mentioned as it greatly contributes to our condition and that is diet. A pure natural diet or “sattvic” one is based on fresh, light, nutritional foods such as fruit, grains and vegetables. This type of food keeps the body lean and limber and the mind clear and sharp, making it most suitable for the practice of yoga. Full of prana or “life-force energy”, a pure and moderated diet is the best possible guarantee of physical and mental health, bringing harmony and vitality to both body and mind. Yoga and a yogic life style are our tools that allow us to become reacquainted with the wonderful feeling of free movement. The yoga posture Down Dog, or Adhomukhashvanasana, is a classic asana done at almost every practice session. 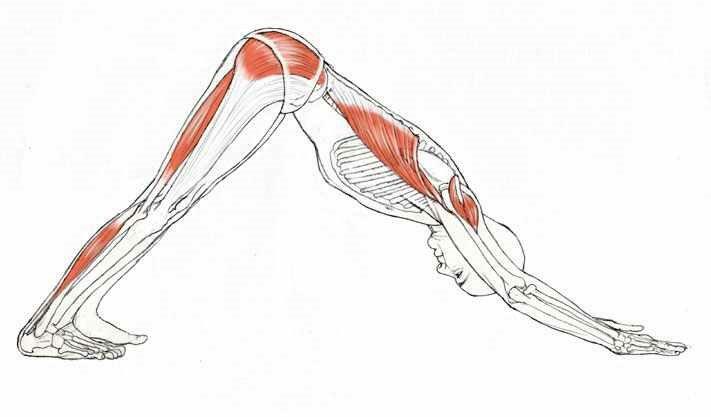 This powerful yoga posture greatly benefits the body when practiced in good form. The muscles stretched in this yoga posture are the gastrocnemius, hamstrings, gluteus maximum, latissimus dorsi, and the pectoralis major. The muscles strengthened are serratus anterior, lower trapezius, deltoids, triceps, pectoralis major, quadriceps, and the transverse and oblique abdominals. In Downward Dog Yoga Posture, not enough attention is placed on hand position. It is important to distribute the weight evenly across the entire hand. The tendency is to place all weight on the heel of the hand which will over stress the wrists. Correct hand position is fingers spread wide, middle or index finger facing forward. To distribute weight across the entire hand, press down with your ring and index finger. When you do this, you will inevitably end up distributing your weight across the entire palm and all five fingers. The chakras are centers of energy in the astral body. The Sanskrit word Chakra is symbolic for a wheel or spinning vortex. There are six chakras located along the Sushumna, or spinal cord, and a seventh at the crown of the head. All are depicted with a certain number of petals, corresponding to the number of nadis emanating from them. Nadis are nerve channels or tubes in the astral body through which prana, or energy flows. Each petal represents a sound vibration produced when the Kundalini energy passes through the chakra. All the chakras except the Sahasara, the crown chakra, have their own color and mantra, or sound, associated with it. At the base of the spine sits Muladhara, or root chakra. It is portrayed as a lotus with four petals. This chakra is located at the base of the spine in the coccygeal region. The color is red for Muladhara. It symbolizes groundedness, foundation, stability and prosperity. The activating sound for this chakra is LAM. It is here that Kundalini lies dormant. Next is Svadhisthana, or sacral chakra. It is depicted as a six petal lotus located at the sacrum. The color is orange. It symbolizes movement, connection, desire and pleasure. The syllable sound for this chakra is VAM. Manipura, or solar plexus/navel chakra is symbolized by a ten petal lotus. The color is yellow and the seed syllable is RAM. Manipura is representive of will, self esteem, power, energy and activity. Anahata, or heart chakra, is symbolized by a twelve petal lotus and is green in color. Located at the heart region, the sound mantra for this chakra is YAM. It relates to love, balance, self-love, relationship and devotion. Vishuddha, or throat chakra, is depicted as a 16 petal lotus and blue in color. The sound is HAM. It symbolizes self expression, finding ones voice, creativity, good listening, and the right to be heard. Ajna chakra, located between the eyebrows, or third eye area, is depicted as a two petal lotus. The color is violet, indigo or deep blue. The activating syllable for this chakra is OM. Ajna relates to intuition, imagination, dreams, insight and vision. And last, Sahasrara, the thousand petaled crown chakra, is the seventh and highest chakra. Located at the crown of the head, it is depicted as a brilliant white light, or violet in color. The Sahasrara chakra represents divinity, union, vision and understanding. Activating the chakras allows the passageway for Kundalini to reach the crown chakra. Kundalini, the Sankrit word for “coiled one”, is a primal energy located at the base of the spine. The Yoga Upanishads describe Kundalini as lying “coiled” at the base of the spine, represented as either a goddess or sleeping serpent waiting to be awakened. 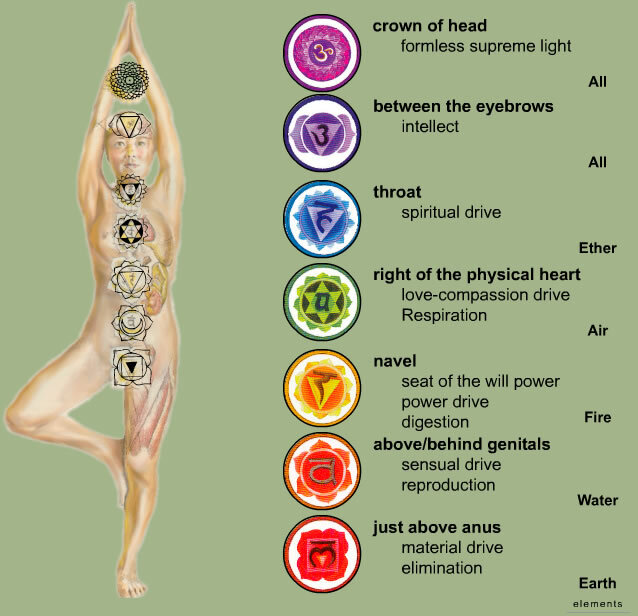 As Kundalini passes through each of the chakras, different states of consciousness are experienced. Different traditions teach methods of “awakening” Kundalini. Yoga breathing techniques and practices activate and arouse Kundalini, causing this dormant energy source to rise up through the chakras. When it reaches the Sahasrara, the thousand petaled crown chakra, the yogi attains Samadhi. Still operating on the material plane, the yogi has reached a level of existence beyond time and space. When Kundalini rises to this point, a state of Samadhi is attained, that of spiritual enlightenment.